Sometimes you may want to multi-task on your Chromebook. 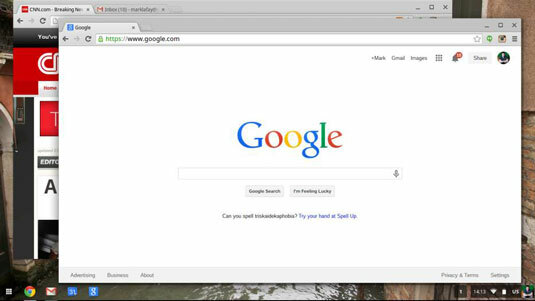 You can multi-task by activating several Chrome windows at once or by opening several tabs within one Chrome window. Tabs are simply additional windows that are grouped together, so named because they look like tabs in a filing cabinet at the top of the browser. 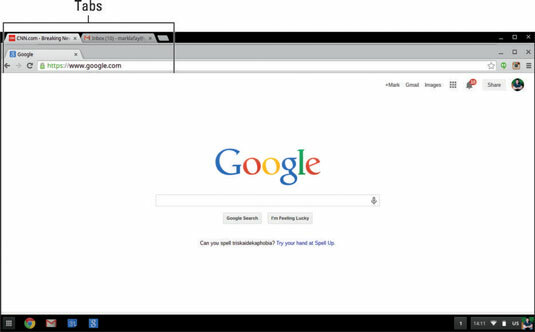 You can quickly switch between windows by clicking on the desired tab. Each tab can be closed individually by clicking the X located on the right side of the tab. All tabs behave in the same manner as the window that contains them. Locate the tab that you wish to break out. Click and hold the desired tab. This brings the tab to the front and makes it active. Drag the tab in any direction until it pops out into its own window, as shown in this figure.